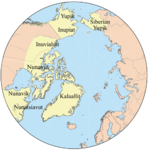 For the language, see Siberian Yupik language. The Siberian Yupik on St. Lawrence Island live in the villages of Savoonga and Gambell, and are widely known for their skillful carvings of walrus ivory and whale bone, as well as the baleen of bowhead whales. These even include some "moving sculptures" with complicated pulleys animating scenes such as walrus hunting or traditional dances. The winter building of Chaplino Eskimos (Ungazighmiit) was a round, dome-shaped building. It is called "yaranga" in the literature, the same word referring also to the similar building of the Chukchi. In the language of Chaplino Eskimos, its name was /məŋtˈtəʁaq/. There was a smaller cabin inside it at its back part, the /aːɣra/, used for sleeping and living. It was separated from the outer, cooler parts of the yaranga with haired reindeer skins and grass, supported by a cage-like framework. But the household works were done in the room of the yaranga in front of this inner building, and also many household utensils were kept there. In winter storms, and at night also the dogs were there. This room for economical purposes was called /naˈtək/. There were also other types of buildings among Chaplino Eskimos: /aːwχtaq/ was a modernized type, and /pəˈɬʲuk/ was used for summer. Many Eskimo cultures had persons working as mediator (between human and beings of the belief system, among others) — usually termed as "shamans" in the literature. As Eskimo cultures were far from homogenous (although had some similarities), thus also shamanism among Eskimo peoples had many variants. Siberian Yupiks had shamans as well. Compared to the variants found among Eskimo groups of America, shamanism among Siberian Yupiks stressed more the importance of maintaining good relationship with sea animals. Ungazighmiit people (the largest of Siberian Yupik variants) had /aˈliɣnalʁi/s, who received presents for the shamanizing, healing. This payment had a special name, /aˈkiliːɕaq/ — in their language, there were many words for the different kinds of presents and payments and this was one of them. (The many kinds of presents and the words designating them were related to the culture: fests, marriage etc. ; or made such fine distinctions like "thing, given to someone who has none", "thing, given, not begged for", "thing, given to someone as to anybody else", "thing, given for exchange" etc.). The Evan people (a tribe that lived on the far eastern side of Russia) believed that the spirit of smallpox could be seen as a Russian woman with red hair. A local shaman would be there to greet migrating reindeer herders (who sometimes brought the disease with them). If the shaman saw the spirit of the disease in the caravan, several shaman worked together to fight it off with a seance. Others in the tribe helped with this ritual. Tradition says that the smallpox spirit changed from a woman to a red bull when she was attacked. The spirit of smallpox was supposed to be very powerful, and if the shaman's ritual failed, all the local people would die. The spirit would only spare two people to bury all the rest. But if the ritual worked, the spirit would be forced to leave. Similarly to several other Eskimo cultures, the name-giving of a newborn baby among Siberian Yupik meant that a deceased person was affected, a certain rebirth was believed. Even before the birth of the baby, careful investigations took place: dreams, events were analyzed. After the birth, the baby's physical traits were compared to those of the deceased person. The name was important: if the baby died, it was thought that he/she has not given the "right" name. In case of sickness, it was hoped that giving additional names could result in healing. hunting amulets were attached to something or worn. About the effige of orca on the tools of the marine hunter, see the beliefs concerning this peculiar marine mammal below. The orca, wolf, raven, spider, whale, were revered animals. Also folklore (e.g. tale) examples demonstrate this. For example, a spider saves the life of a girl. The motif of spider as a benevolent personage, saving people from peril with its cobweb, lifting them up to the sky in danger, is present also in many tales of Sireniki Eskimos (as mentioned, their exact classification inside Eskimo peoples is not settled yet). It was thought that the prey of the marine hunt could return to the sea and become a complete animal again. That is why they did not break the bones, only cut them at the joints. In the tales and beliefs of this people, wolf and orca are thought to be identical: orca can become a wolf or vice versa. In winter, they appear in the form of wolf, in summer, in the form of orca. Orca was believed to help people in hunting on the sea — thus the boat represented the image of this animal, and the orca's wooden representation hang also from the hunter's belt. Also small sacrifices could be given to orcas: tobacco was thrown into the sea for them, because they were thought to help the sea hunter in driving walrus. It was believed that the orca was a help of the hunters even if it was in the guise of wolf: this wolf was thought to force the reindeer to allow itself to be killed by the hunters. It is thought that during the hunt only those people who have been selected by the spirit of the sea could kill the whale. The hunter has to please the killed whale: it must be treated as a guest. Just like a polite host does not leave a recently arrived dear guest alone, thus similarly, the killed whale should not be left alone by the host (i.e. by the hunter who has killed it). Like a guest, it should not get hurt or feel sad. It must be entertained (e.g. by drum music, good foods). On the next whale migration (whales migrate twice a year, in spring to the north and in the autumn back), the previously killed whale is sent off back to the sea in the course of a farewell ritual. If the killed whale was pleased to (during its being a guest for a half year), then it can be hoped that it will return later, too: thus, also the future whale hunts will succeed. In a tale, the sky seems to be imagined arching as a vault. Celestial bodies form holes in it: beyond this vault, there is an especially light space. ^ a b c Vajda, Edward J. 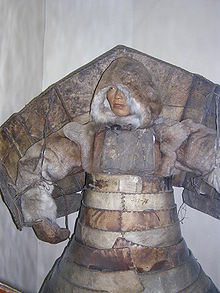 "Siberian Yupik (Eskimo)". East Asian Studies. ^ Tony., Allan, (1999). Spirits of the snow : Arctic myth. Phillips, Charles., Kerrigan, Michael, 1959-, Duncan Baird Publishers. Amsterdam: Time-Life Books. ISBN 0705436535. OCLC 43438183. Menovščikov, G. A. (= Меновщиков, the same author as at the Russian part) (1968). "Popular Conceptions, Religious Beliefs and Rites of the Asiatic Eskimoes". In Diószegi, Vilmos (ed.). Popular beliefs and folklore tradition in Siberia. Budapest: Akadémiai Kiadó. Меновщиков, Г. А. (1962). Грамматиκа языка азиатских эскимосов. Часть первая. Москва • Ленинград,: Академия Наук СССР. Институт языкознания. The transliteration of author's name, and the rendering of title in English: Menovshchikov, G. A. (1962). Grammar of the language of Eskimos. Vol. I. Moscow • Leningrad: Academy of Sciences of the USSR. Меновщиков, Г. А.сиреникских эскимосов. Фонетика, очерк морфологии, тексты и словарь (1964). Москва • Ленинград,: Академия Наук СССР. Институт языкознания. Missing or empty |title= (help) The transliteration of author's name, and the rendering of title in English: Menovshchikov, G. A. (1964). Language of Sireniki Eskimos. Phonetics, morphology, texts and vocabulary. Moscow • Leningrad: Academy of Sciences of the USSR. Rubtsova, Ekaterina Semenovna. Yupik Eskimo Text from the 1940s (pdf). Collection of 27 texts collected by Rubtsova in 1940-1941. Translated into English and edited by Vakhtin. (The English version is the last file at the bottom of the page.) Downloadable from UAF's site licensed under Creative Commons Attribution-Noncommercial-No Derivative Works 3.0 United States License. Vajda, Edward J. "Siberian Yupik (Eskimo)". East Asian Studies. Ludmila Ainana; Tatiana Achirgina-Arsiak; Tasian Tein. "Yupik (Asiatic Eskimo)". Alaska Native Collections. (in Russian) Г.А. Меновщиков: Азиатских эскимосов язык is a summary of the Chaplino dialect. It can be read among other articles, collected under name Языки мира — Палеоазиатские языки (Languages of the world — Paleoasian languages). Wikimedia Commons has media related to Yupik. Поселок Унгазик (Чаплино) (in Russian). Музея антропологии и этнографии им. Петра Великого (Кунсткамера) Российской академии наук. Archived from the original on 2009-02-28. Rendering in English: Ungaziq settlement, Kunstkamera, Russian Academy of Sciences. "Ungazik settlement". Kunstkamera, Russian Academy of Sciences. Ungaziq is the name-giving settlement for the largest Siberian Yupik group, Ungazighmiit. Enlarged versions of the above series, select with the navigation arrows or the form. Поселок Наукан (in Russian). Музея антропологии и этнографии им. Петра Великого (Кунсткамера) Российской академии наук. Archived from the original on 2009-02-28. Rendering in English: Naukan settlement, Kunstkamera, Russian Academy of Sciences. "Naukan settlement". Kunstkamera, Russian Academy of Sciences. Enlarged versions of the above series, select with the navigation arrows or the form. Geist, O. W. (photo by) (1927). "Gut parka". Alaska Native Collections. Anchorage Museum of History and Art. “Nita Tokoyu of Gambell, St. Lawrence Island, sews a gut parka with Kakhsogon (left) and Wiyi (right) standing by". Choris, Ludovik (illustration by) (c. 1825). "House interior". Alaska Native Collections. Anchorage Museum of History and Art. “Yupik men wear gut parkas in this image of a St. Lawrence Island house interior, c1825".